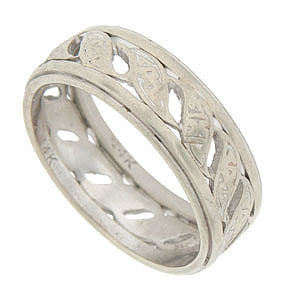 A detailed pattern of large twisting leaves covers the face of this 14K white gold vintage wedding band. Smooth bands frame the central pattern. The wedding ring measures 6.92 mm in width. Circa: 1940. Size 8 1/2. We cannot re-size.